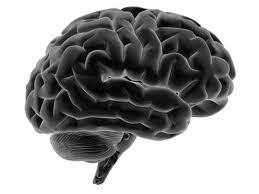 Contrary to recent reports, a new study finds that in fact, kirtan is NOT good for your brain. A study just published in the Journal of Alternative Brain Research found that kirtan seems to actually shut down the prefrontal cortex, the “thinking” part of the brain involved in higher cognitive functions such as executive control, planning, and impulse regulation. Kirtan, a call-and-response form of mantra repetition set to music and performed in group settings, is not to be confused with kirtan kriya, a more meditative and usually solo form of chant recitation that also includes hand movements and visualization, which was the focus of earlier research. The authors of the new study used functional brain imaging to assess neural activity during a simple task in subjects who had just finished a 12-hour kirtan. 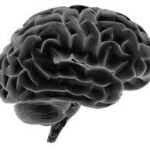 Remarkably, they found a complete absence of activity in brain areas involved in logical thinking, emotional control, and reasoning. Instead, they found extremely heightened activity in the pleasure circuitry of the brain, including reward-related structures such as the ventral striatum and nucleus accumbens — the same brain areas activated by illicit drug use. 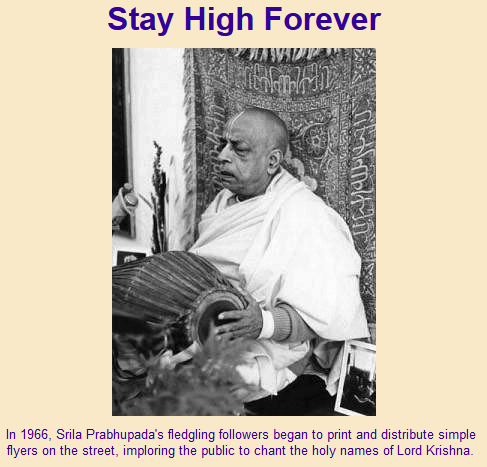 These results seem to add credence to the vernacular phrase “stoned on the bhava,” which was often repeated by the late great bhakti scholar and kirtan wallah Shyamdas, lead author Vrinda Bhavananda said in an interview with The Bhakti Beat. 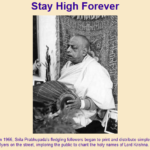 The findings are also in line with pamphlets distributed by early followers of A.C. Bhaktivedanta Swami Prabhupada, the Indian monk who brought Krishna Consciousness to the West in the 1960’s, that used the slogan “Stay High Forever: No More Coming Down” to implore LSD-loving hippies from the counterculture movement to chant instead of take drugs. Dr. Bhavananda, a kirtan practitioner herself who undertook the study to shed light on her observances of people post-kirtan, also contended that the results help explain the well-documented phenomenon of “bhav brain,” which has seen a startling rise in kirtan hot spots as diverse as Southern California, Brooklyn, N.Y., and the little town of Burlington, Vt. Bhav brain, a condition marked by hugging strangers, tendency to lose things, and an inability to use simple devices like gas pumps, is particularly prevalent after multi-day kirtan festivals, which have become more common as the call-and-response chanting practice has exploded in popularity. In fact, the Bhakti Alliance, a kirtan-accrediting organization that has stirred great controversy in the bhakti world, was established in part to help contain the spread of bhav brain. The scientists plan to continue their research on the brain effects of kirtan to better understand what it is about chanting the Names that seems to shut down the “monkey mind” and increase feelings of bliss and joy. They are also collaborating with experts in heart research to examine exactly how kirtan causes a “heart-opening” feeling, as many practitioners describe it. If you are a kirtan lover who would like to participate in this ongoing research, call 1-800-BHAVON2. Happy April Fool’s Day from The Bhakti Beat! Dear Lord, kindly engage me in your service.